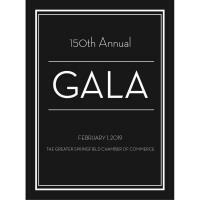 The Greater Springfield Chamber of Commerce will host its 150th Annual Gala on Friday, February 1 at the Crowne Plaza Springfield Convention Center. This prestigious dinner provides an opportunity to gather with top business and community leaders throughout Sangamon County. The Chamber holds the Annual Gala to celebrate accomplishments from the previous year, review priorities for the current year and recognize exceptional volunteer leaders. The evening is also a great chance to further build relationships with colleagues and other business leaders. The evening will begin with cocktails starting at 6:00 pm, dinner at 7:00 pm, and the program at 7:45 pm, followed by our popular networking reception! Tickets are available at $60 per person for Chamber members on or before the early bird deadline of Friday, January 18 ($75 after this date) or $850 for a table of 10 (the deadline to have a business name printed in Gala program is Jan. 11). Non-members may also purchase tickets at a flat rate of $95.00. We hope you will join us, other Chamber members, and community leaders for what promises to be a great evening. We're expecting another large crowd and recommend everyone register early, or buy a table and invite your staff and key clients!